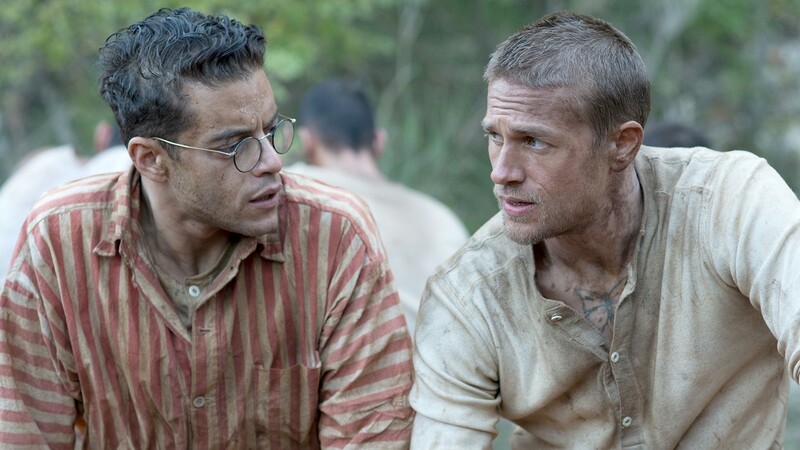 Rami Malek (left) and Charlie Hunnam plot their escape in Papillon. Michael Noer's remake of Papillon has a difficult sales job in front of it. Practically anyone who might be remotely interested in seeing its downbeat, violent story of two men and their struggles to survive a brutal French tropical prison is already well aware that the only movie that really needed to be made on the subject came out in 1973, starring Steve McQueen and Dustin Hoffman. But despite all of that, someone will insist on seeing the new version. What's a curious, open-minded moviegoer to do? 1. Pretend you're watching McQueen and Hoffman. It won't be too difficult, really. English actor Charlie Hunnam, in the title role of Henri "Papillon" Charrière, has the same basic body type as the late McQueen, plus a workable facial resemblance. As for Rami Malek's Louis Dega, Papillon's bespectacled prison buddy, he may not resemble Hoffman but his filmography (TV's Mr. Robot, the upcoming role of Freddy Mercury in Bohemian Rhapsody, etc.) is almost as quirky as Hoffman's early days. If we squint hard, we can imagine Hoffman and McQueen up there. 2. Pretend it's in French. If it worked for Sorcerer (aka The Wages of Fear) or Down and Out in Beverly Hills (original French title: Boudu sauvé des eaux), it should do the trick here. 3. Add up all the little distracting details. One of the most glaring is the absence of hot burning sun. Hoffman and McQueen sweated profusely in the earlier film, and we felt the tropical heat along with them as they took their licks from the guards and later slogged through the jungle trying to escape. Hunnam and Malek don't seem to suffer enough. Another point: The original King Kong is screened for the prisoners, and apart from noting the similarity to Sullivan's Travels and its Mickey Mouse-for-the-chain-gang-inmates payoff scene, we get the feeling there's something we'd rather do, which is continue watching King Kong instead of Papillon. 4. Ask the theater manager for your money back because you mistakenly thought it was going to be the high-def upgrade of the Franklin J. Schaffner-Dalton Trumbo-Lorenzo Semple Jr.-William Goldman-McQueen-Hoffman version. It's worth a try.